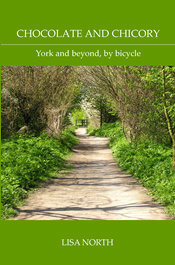 During the Second World War, Yorkshire was home to around 40 airfields, many in the flat areas of the Vale of York. More than 18,000 airmen died flying from the Yorkshire airfields, some lost on training flights, because of weather conditions or aircraft malfunction. The memorials here are just two of many. Both these aircraft were on training flights, and both crashed within a week of one another, in February 1944. There’s something particularly moving about finding a memorial, by chance, in a place you wouldn’t expect. We were out in the car heading for a village off the A166. We missed the turning and had to turn round in a layby. At the edge of the layby, in front of a cornfield, was this memorial, erected by Alun Emlyn-Jones, remembering his comrades. 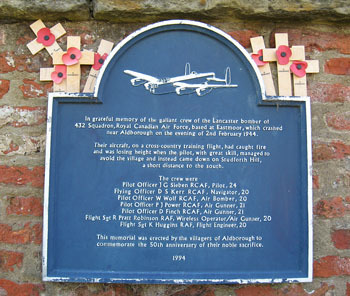 The inscription states that the memorial marks the location where, on 7 February 1944, at 10am, Halifax bomber DK192 from RAF Rufforth crashed in 10/10ths cloud during a training flight, killing all the crew. The driver of a milk lorry, Mr Arthur Wood Kirkby, who was passing on the road, was also killed. 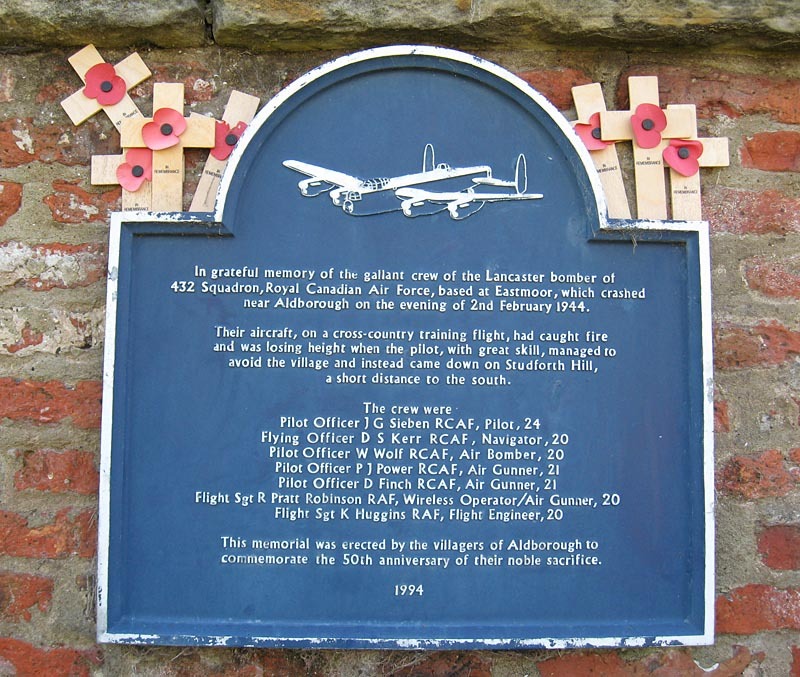 The villagers of Aldborough erected this memorial in 1994, to mark the 50th anniversary of another Second World War crash, which occurred on 2 February 1944. The Lancaster bomber, of 432 Squadron, Royal Canadian Air Force, was another bomber on a training flight. Five of the crew were from the Canadian forces, two from the RAF. Flight Sgt Kenneth Huggins was a Yorkshireman, from Bradford. It is clear, as you read these details, why the memorial was erected not just ‘in memory of’, but ‘in grateful memory of’. Click on the photo for a larger view showing the names of the crew. This crew were based at East Moor, near Sutton-on-the-Forest. 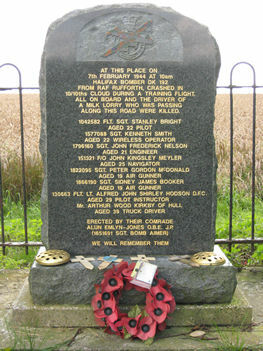 There’s a memorial to all who served at East Moor, close to the site of the former airfield. www.yorkshire-aircraft.co.uk – containing information regarding the many aircraft accidents in Yorkshire. His name was Alexader Forsyth, a metroplolitan policeman who was in the Royal Airforce Volunteer Reserve. According to his police records he died in 1944 on ‘active’ service but family stories suggest he was on a training flight over yorkshire. The details of the crash involving Sgt Alexander Forsyth A/G. Thank you, David. This information is really helpful. I believe about 8-9000 men were lost on training flights. What a waste of life. Presumably there were mechanical problems with the planes. Hope that’s helpful, good luck with your search and I’d love to know if you do find the information you’re looking for. Son of Alexander and Isabella Forsyth; husband of Zena Forsyth, of Monks Orchard, Surrey. Talk to Yorkshire Air Museum & Allied Air Forces Memorial, Elvington. York YO41 4AU. 01904 608595. I don’t know if anyone can help…my uncle John Joseph Westland became a Navigator on a Halifax aircraft, having trained in Yorkshire and was apparently shot down in a raid on Kiel on 26 / 27 Feb 1942. I would love to know more about his history. Op. Kiel..took off from RAF Leeming at 18-23hrs. Took off 1823 hrs Lemming. lost without trace. All are commemorated on the Runnymede Memorial. 49 aircraft – 33 Wellingtons, 10 Hampdens, 6 Halifaxes – to attack the floating dock. 2 Wellingtons and 1 Halifax lost. Crews claimed good results in clear weather with bombs close to the floating dock. A high-explosive bomb scored a direct hit on the bows of the Gneisenau, causing severe damage and killing 116 men in the crew. This proved to be the end of Gneisenau as a fighting unit. Bombing in the town of Kiel destroyed several houses and killed 16 people. Thank you so much for this information. I am collating everything and writing his story to keep his memory alive. I am indebted to you. Thank you very much indeed for responding. It means a lot that I can compile his story. Thank you Kevin for adding this information. As it’s been a while since Michael added his query I will email him on the address he gave then and hope to reach him. Thank you for the information regarding my uncle, Alec Forsyth. I have also been following up various leads. It was very kind of you to post the information, Kevin.